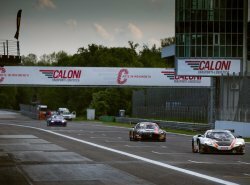 McLaren GT Factory Drivers Rob Bell, Côme Ledogar, Shane van Gisbergen and Alvaro Parente claimed victories in Europe and North America as the 650S GT3 enjoyed a strong weekend. 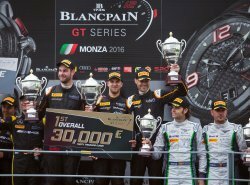 The race-focused version of Super Series model secured a dramatic win at the opening round of the 2016 Blancpain GT Series Endurance Cup in Monza, Italy, a double podium in the Pirelli World Challenge at Barber Motorsports Park in the USA and pole position and a win at the first weekend of the International GT Open championship in Estoril, Portugal. 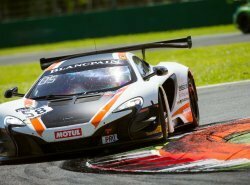 In the all-Factory Driver line-up #58 McLaren 650S GT3 of customer team Garage 59, Bell started the three-hour race P16 alongside the all-McLaren GT Academy Driver trio of Alex Fontana, Struan Moore and Andrew Watson in P15. The experienced Brit quickly fought through the pack, climbing as high as P3 during his stint, before a quick pit stop by the team vaulted the car into the lead with Ledogar aboard. Frenchman Ledogar – making his competitive debut as a Factory Driver with McLaren GT – drove faultlessly through traffic and retained the lead against one of the most competitive GT grids, before van Gisbergen took over for one of the most exciting and closest finishes the championship has ever seen. During the final stint of the race, the rapid van Gisbergen defended the lead as he negotiated back-markers around the historic 3.6-mile Italian circuit. As the chequered flag fell after 96 hard-fought laps and three hours of racing, the New Zealand-born driver brought the #58 650S GT3 home to secure the top step of the podium with a winning margin of just 0.341s, and score the team its first win in the Championship. In the United States, fellow Factory Driver Alvaro Parente enjoyed a successful weekend at the wheel of the 650S GT3. Parente, driving for customer team K-PAX Racing, won Round 6 of the Pirelli World Challenge on Saturday, and finished second on Sunday morning in Round 7 at the challenging Barber Motorsports Park circuit in Alabama. The results place Parente firmly in the running for the Drivers’ Title. A third win for the 650S GT3 was secured at the opening weekend of the International GT Open, as customer team Garage 59 enjoyed further success in the second race at Estoril in Portugal. Kevin Estre and Alexander West secured pole position in the #88 650S GT3, and the French-Swedish pair looked set for a convincing victory until a misjudged overtake by a competitor ended the charge on the final lap. Charging to the line, the #59 650S GT3 of Michael Benham and Duncan Tappy reacted quickly to the incident with the British pair taking the lead in another dramatic race finish.